The place is very clean and beautiful, has all the necessary facilities and a super friendly host. The apartment is very cosy and the size is perfect for a family with 2 children. The kitchen is well equipped. The location is a bit remote, not in the busy part of Nazaré, so good if you want peace and quiet. Everything was great! The host met us upon arrival and showed us around the property. Its a beautiful apartment above the owner house. You have your own entrance so there's no feeling of intrusion. The guests are welcome to use the outside bbq facilities which we did and it was great. Also a very child friendly place - lots of toys and space to run around, as well as a travel cot (or spare kids room) for your children. Very clean and modern apartment! The pictures do reflect the reality! Great location - walking distance to an aquapark and Northern beach of Nazare, coffee shops. This property is a gem! We stayed here as a family of five and absolutely loved our stay. It is comfortable, exceptionally clean, and very spacious. Everything is in excellent condition and beautifully decorated. The kitchen is fully stocked and the apartment had everything we needed. The ocean views are lovely. It is an excellent location for exploring Nazaré and Sítio, as well as relaxing. The hosts are very kind and helpful. We only wish we could have stayed longer. Do not hesitate to book a reservation here! Loved the apt, very lovely. Walking distance to the beach. Good walking areas for our dog. Very peaceful, away from downtown area perfect for us. One of best apartment I've even been. 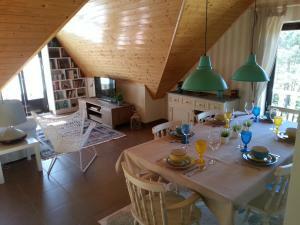 It is charming, spacious and functional apartment/loft occupying the floor of the villa. All the equipment was perfect. The apartment was decorated with great taste. It has three bedrooms, two bathrooms, kitchen, dining and living room - everything was perfect. 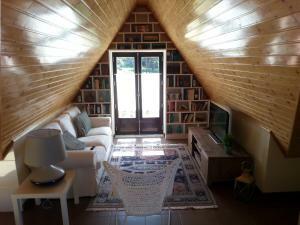 Situated in Sitio, the top of Nazare with easy access to both beaches and the the "farol" with great waves. Super starting point to the nearby attractions - Alcobaca, Batalha, Ourem, Tomar, Fatima and many other. The owner was very helpful. I highly recommend this apartment !!! I'm really satisfied with my experience in Villa Ana. She was really kind, nice and helpful in everything we needed. The house was impeccable, modern. Highly recommendable. Lock in a great price for Villa Ana – rated 9.7 by recent guests! One of our top picks in Nazaré – and a guest favorite. Surrounded by a pinewood and offering sea views from afar, Villa Ana is a refurbished 3-bedroom house in Nazaré. It features a romantic colorful décor and free WiFi. Providing a cozy setting, the living room features walls covered with shelves full of books. Some bedrooms have a mosquito net and strong colors. The house features sloped ceilings and the living/dining room opens to the fully equipped kitchen. Barbecue facilities are available outdoors. The nearest beach is within a 20-minute walk, and Nazaré Beach is 1.6 mi away. Guests wishing to explore the area can head to Alcobaça monastery, located 8.7 mi away from Villa Ana, and to Óbidos town, located a30-minute drive. The A8 motorway is a 15-minute drive. Lisbon International Airport is 73 mi away from Villa Ana. 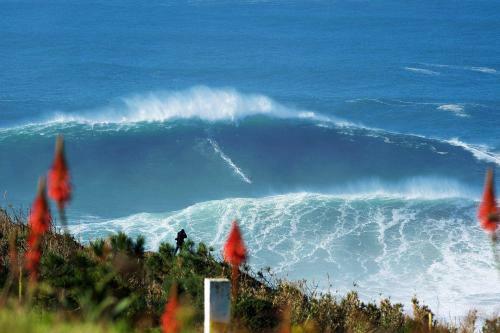 This is our guests' favorite part of Nazaré, according to independent reviews. 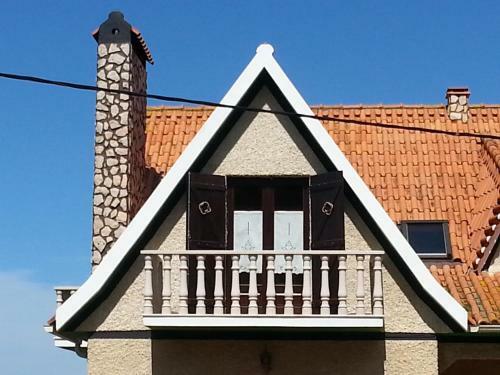 This property is also rated for the best value in Nazaré! Guests are getting more for their money when compared to other properties in this city. 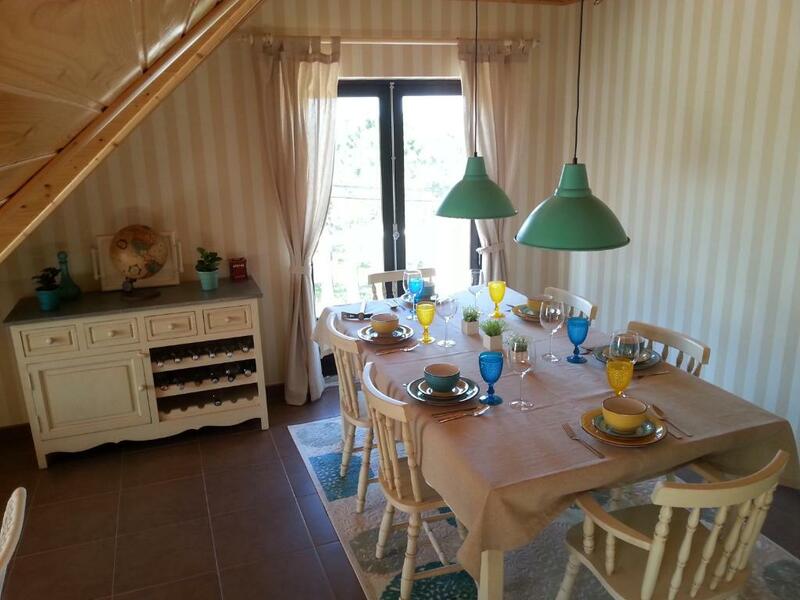 뀐 Located in the top-rated area in Nazaré, this property has an excellent location score of 9.5! When would you like to stay at Villa Ana? A nossa casa é muito especial, pois foi construída com muito amor, com muita dedicação e com muito esforço. Além disso a nossa casa fica perto do mar, na floresta de pinheiros, onde se pode ouvir o som do mar e o som dos pássaros, serão estes os sons com que acordará. A apenas 2 minutos a pé do centro do Sitio da Nazaré, onde poderá desfrutar de uma maravilhosa vista sobre o oceano, e a 5 minutos a pé da Praia do Norte, North Canyon, onde poderá ficar abismado com as suas ondas grandes, tendo sido considerada uma das melhores praias desertas da Europa. 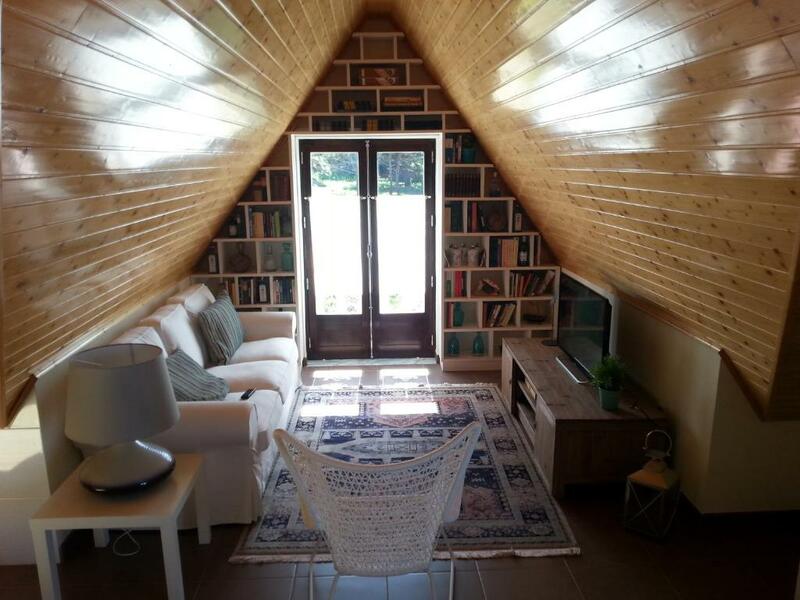 A casa está decorada com um estilo intemporal e confortável, onde terá tudo aquilo que necessita para passar uma estadia maravilhosa. Maravilhe-se com a vista mar e o cheiro dos pinheiros e poderá aproveitar o nosso barbecue para fazer deliciosos churrascos. Aliado a tua isto, com a nossa simpatia e o desejo de tornar esta sua estadia memorável, pois tudo faremos para o conseguir. Somos uma família nazarena, que iniciou este projecto familiar à mais de 20 anos através de agências de aluguer Holandesas e Belgas. Com os surgimento da Internet e das novas tecnologias, decidimos fazer uma aposta forte no marketing e publicidade e melhorar a nossa oferta. Esta propriedade em especifico foi alvo de remodelação total em 2014. Somos uma família simples, humilde e simpática que gosta de partilhar experiências e histórias de vida com os nossos clientes, estamos pois dispostos a tudo fazer para que se sintam em casa. Sejam bem vindos! A zona onde está a nossa casa, é um quarteirão residencial apenas com casas isoladas, uma zona refinada, calma, e extremamente tranquila, onde apenas se ouve o barulho do mar e os pássaros, rigorosamente nada mais. É uma zona muito calma e tranquila, que os nossos hóspedes têm adorado tal como pode ler nos nossos comentários. Relativamente a lojas e restaurantes locais, a Nazaré tem uma oferta diversificada de restaurantes, tanto de carne como de peixe, pois a Nazaré é uma Vila piscatória, restaurantes gourmet, marisqueiras, sushi, pizzas e indiano. Como actividades pode contar com um parque aquatico aberto no verão, passeios de cavalo, caminhadas, treking, passeios de bicicleta, escolas de surf, bodyboard e Stand Up Paddle. As imensas praias também convidam a passeios longos pelas suas areias douradas e mar azul. Pode também passear e descobrir os imensos pinhais com a sua flora e fauna caracteristica. House Rules Villa Ana takes special requests – add in the next step! Please inform Villa Ana of your expected arrival time in advance. You can use the Special Requests box when booking, or contact the property directly using the contact details in your confirmation. Only minor: The washing machine was outside not for our sole use. Could only use it in the mornings. We stayed in November and when we arrived the heating was not turned on. It took a few hours to heat up the place to a comfortable level. The bed in the master bedroom is small (less than 160cm). The apartment should be most signed :) Besides - NOTHING !!! Nothing. It was a great experience. The house was beautiful and exceptionally clean. It was easy to walk into the Old Town, and catch the funicular to the beach.